Dallying In The Dirt, Issue #254--- Daffodil delirium is the next step on the voyage. I left you last week as I was admiring the Crocus in Copenhagen. 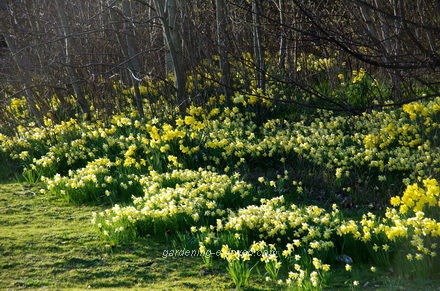 The next day it was Daffodil time around the scenic village of Riding Mill in Northern England. They have thousands of them, all different varieties and sizes, planted along most of the roadsides and we have managed to be here when they are in full bloom. It just happens to coincide with the school break week of two delightful granddaughters that seem to be the focus of the Assistant Gardener’s attention. It’s wonderful being able to have an early spring and contemplating going back home to watch a second one unfold. There are a few Magnolias with their large pink blooms and a sprinkling of bright yellow Forsythia bushes in bloom. Many of the garden walls are covered in the cascading pink bloom of Heather. Luckily I’m not driving so I can take in all of the spring that is exploding everywhere we go and I don’t have to remember to drive on the other side of the road. We wandered into downtown Newcastle one day with two little girls and found a “Build A Bear” shop that delighted our little charges. While wandering the large pedestrian concourse that is the shopping district, I noticed this amazing store front. 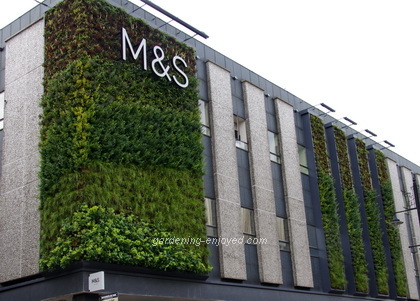 Yes, all the greenery you see covering the walls consists of hundreds of live plants that are happily soaking up the carbon dioxide and providing Oxygen while looking amazingly attractive. I was unable to get up close to find out any details about how it was constructed or maintained and my interest in it was not shared for more than a few moments, by my little companions. Back home, in the real garden, things are moving much more slowly. The wonderful neighbour has been keeping a close eye on the many seeds and seedlings in the basement. It is starting to look like a jungle down there and there will be many things to catch up on as soon as we return. 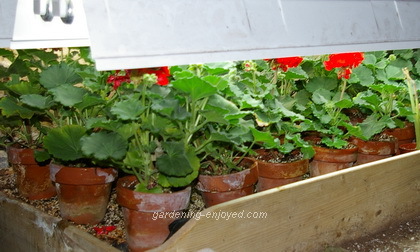 These Geraniums are pushing the boundaries of available space under their lights. They really want to be transplanted to bigger pots and moved out to the cold frame. That will be job one. Nothing else can happen until they leave the basement and create some space. Then I can start to transplant all of the seedlings that will have emerged in our absence. There were several varieties of Peppers and many other things left to germinate in our absence. It’s always a great shuffling of plants at this time of year as we try to maximize the available space. Dan Asks? I have two large pots of Elephant Ears hibernating under cover in my basement. Each pot has several (4 - 5) bulbs. I'm planning on dividing them up and repotting them in fresh soil. Last year's performance was not as good as I hoped for. What is your recommended time line? Should I fertilize? If so, when? Ken Answers! I'm potting up my Colocasia tubers now. Once outside they do like a steady supply of water and fertilizer. Elaine Asks?Heard you at Creemore Hort Society. I have some pepper seeds to grow this year. Need some tips. Should I soak them and then freeze to crack the coat? When to start seeds, and then transplant? Ken Answers! I will start my Peppers this week. Easy to germinate, just plant and cover lightly and keep moist. Big tip, warm their soil to about 75F and they will germinate much quicker.